On this World Environmental Day – 5th June, 2017 we take immense pride in announcing our eFACiLiTY® Building, our software development center in Coimbatore being rated the World’s 2nd Highest ranking Green Building rated by GBCI under LEED NC v2009. 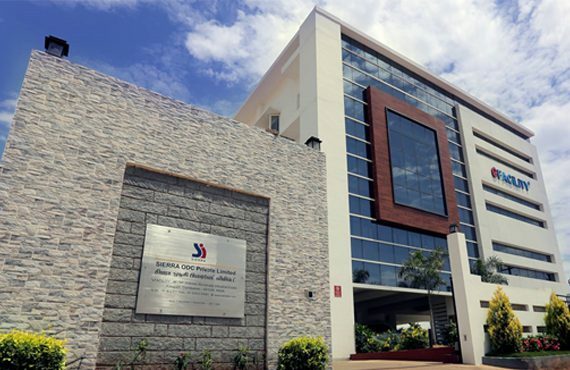 We have been awarded 103 points out of the possible 110 thereby making it to the World’s 2nd Highest and India’s Highest Ranked Green Building – http://in.usgbc.org/projects/efacilitysierra-odc. eFACiLiTY® Building is designed and constructed to be among the best of the greenest buildings in the world and also has the trappings of one of the highly automated buildings in the world. Concern about the alarming rate of global warming is one of the primary reasons that prompted this endeavor, what with 2016 being declared the 3rd hottest year on record, give or take 1.2° relative to the pre-industrial era. The last 35 years have witnessed the frightful phenomenon of continuously shrinking glaciers, and the green truth of Antarctica going Green instead of remaining white as it rightfully should. Blame it on the effect of the greenhouse gases in the rest of the world that is causing unprecedented global warming and causing the ice in Antarctica to melt. As a result, plant life is growing at a rapid pace in the wrong side of the planet. The triggering of abnormal temperatures, with parts of Arctic Russia recording 6 to 7° rise in temperatures in 2016 rings a warning bell. The world has witnessed some extreme weather, with a sharp increase in violent typhoons (12 to 15%) in the last 37 years alone. For the first time ever, CO2 concentrations exceed 400 ppm, while normal levels shouldn’t ideally exceed 250 to 350 ppm in outdoor ambient air. The havoc caused by greenhouse gas emissions and global warming witnessed 19.2 million new human displacements due to weather, water, climate and geographical hazards in 2015. El Niño, the climate cycle in the Pacific Ocean, triggered a 15-mm rise in global sea levels between November 2014 and February 2016, which is far above the post 1993 trend that was a mere 3 to 3.5 mm per year. How do Green Buildings make a difference? Every stage of growth and development of our communities has an immense impact on our environment. The buildings in which we live and work account for 40% of global energy consumption and green buildings can significantly help combat climate change. At every stage, be it, sourcing materials, manufacturing, construction and operation the process results in steady depletion of the world’s natural resources. A green building focuses on increasing the efficiency of resource use – energy, water and materials – while reducing building impact on human health and the environment during the building’s lifecycle, through better siting, design, construction, operation, maintenance and removal. All future buildings need to be built green in order to reduce the overall impact of the built environment on its surroundings. What is LEED rating system for Green Buildings? Adopted by 164+ countries, LEED (Leadership in Energy and Environmental Design) is the most widely accepted, recognized and used green building rating system in the world. LEED provides a framework that project teams can apply to create healthy, highly efficient, and cost-saving green buildings. LEED certification is a globally recognized symbol of sustainability achievement. The above is an outcome of our humble initiative to create awareness among the public on the Global Warming Issues and the urgent need for all buildings on the planet to become Green Buildings to make a positive impact. A small, MSME organization achieving this should provide the practicality in the minds of the people to follow suit and we hope that every single building or factory built in India and abroad goes green in the immediate future for a safe and healthy sustenance of life on our planet. We will be sharing and publishing the knowledge we have gained, the technologies adopted and the innovations deployed in our green building openly in various platforms for everyone to improvise upon and replicate freely to make our planet greener and a safer place to live in. Taking the concept a step further, we are in the process of setting up a Green Learning Center at our premises, where students, social enthusiasts, industry experts, and the general public can learn and appraise themselves on the impacts and ways to go green. We humbly request your support in spreading the message for a better tomorrow for our future generations.